Why we love it: Lily Bloom had a difficult upbringing; an only, lonely child witnessing her parents’ abusive relationship, she finds solace in growing things, the coincidence of her name not escaping her, and in the intimate cry-for-help journals that take the form of personal letters to her heroine Ellen DeGeneres. When Lily finds an older boy from her school, Atlas Corrigan, squatting in a nearby empty house, she is moved to pity but that soon turns into something more and Atlas becomes an unforgettable force in her life. Years later, Lily has matured into an independent woman who fulfils her dream of moving to Boston and starting her own business. As if life couldn’t get any better, she meets a handsome neurosurgeon, Ryle, and falls hard for him. Only thing is, there are issues from his past, he’s absolutely committed to his career, and he’s got a firm no-dating rule. The attraction turns out to be too much for him though and that rule will soon be broken. Just as life seems to be too good to be true, Ryle and Lily are forced to confront the skeletons in Ryle’s cupboard that continue to haunt him. At the same time, the mysterious Atlas comes back into Lily’s life and things start to get really complicated so that she must make some agonising decisions. While there are cute and romantic elements to this novel, there is much more to this story as the plot develops. 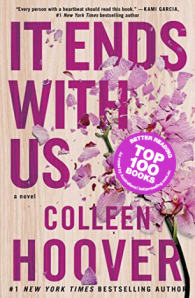 Based on her own experience of domestic violence, Colleen Hoover has delivered a deeply personal and hard-hitting novel that absorbs the reader totally with its loveable and believable characters. It recognises that life is not simple so that the reader, like the heroine, is thrown into a complex dilemma about who to sympathise with. The abuser is not painted simplistically as the bad guy, in fact there’s so much about him to like that, like Lily, and the author, we fall for him and so we don’t judge the victim – as often happens in such cases – for her continued confusion. It’s painful for us too as she makes her heartrending decisions about her marriage and her future. Somehow this is both a deeply romantic and confronting book. Get excited for New Releases this August!, Better Reading Presents … Australia’s Top 100 for 2017!